If you’ve been reading me for any length of time, you’ll know that I have a “thing” for word processors. This is partly because I spend so much time writing but also because I remember the cowboy days of word processing when our computers were 8 bits and there were 20 different developers trying to build a better mousetrap. 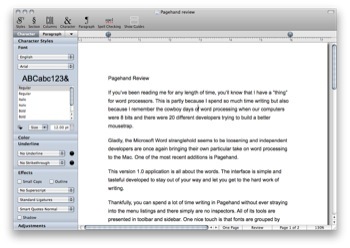 Gladly, the Microsoft Word stranglehold seems to be loosening and independent developers are once again bringing their own particular take on word processing to the Mac. One of the most recent additions is Pagehand. This version 1.0 application is all about the words. The interface is simple and tasteful developed to stay out of your way and let you get to the hard work of writing. Thankfully, you can spend a lot of time writing in Pagehand without ever straying into the menu listings and there simply are no inspectors. All of its tools are presented in the toolbar and sidebar. One nice touch is font are grouping by style so if you are looking for a nice decorative sans serif, they are easy to find. It is always refreshing to see a developer create an application with no regard to feature lists. However, there are a few things missing from Pagehand that could make it a deal breaker for some. You can’t track changes and there are no footnotes or endnotes. For me, that severely limits my ability to use Pagehand. Likewise the page layout and table support is present but not nearly as robust as in Apple’s Pages application. The thing is, those features that Pagehand does include are done extremely well. I’ve always used paragraph styles but I’m the only person I know who does (and I talk to a lot of writers). I think part of the problem is implementation. 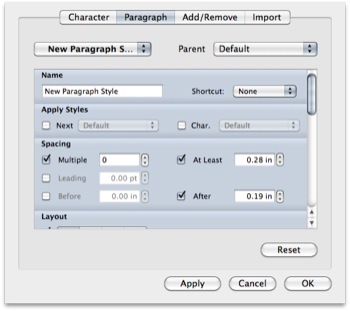 Pagehand has made developing, customizing, and naming paragraph styles very intuitive. In terms of character and paragraph customization, Pagehand excels. There are four different styles of underline and four styles of strikethrough. You can apply shadow and control the angle, offset, blur, and opacity. The hyphenation control includes sliders for the current paragraph and entire document. Pagehand also changes the rules with file format. Pagehand’s native file format is called Pagehand PDF. This way, any saved Pagehand file can be opened in any PDF reader on any platform. What a great idea. In addition, Pagehand also imports and exports to the usual suspects including Microsoft Word and several text formats. Although importing Microsoft Word documents that include unsupported features, such as footnotes, led to some grief. I can’t help but really like this application. The simplicity of the user interface and the moxy of simply ignoring several of the word processing features everyone expects is endearing. If you don’t need those missing features, Pagehand may be the answer you are looking for. I suspect there will be some feature creep with future versions and look forward to seeing how the developer does this and keeps the elegant simplicity. You can download Pagehand from Pagehand.com. The introductory price is $40 but that will eventually go to $50. You can listen to this review on the Mac Review Cast.